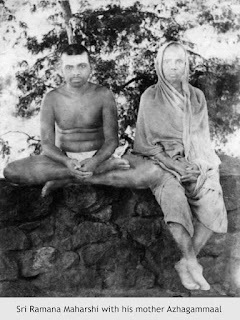 Sri Ramana Maharshi stayed at various places in Thiruvannamalai and then in several caves on the Arunachala Hill until he finally settled at what came to be called Sri Ramanasramam where he lived until his Mahanirvana in April 1950. He never took formal sannyasa nor did he claim to have any disciples. From the day he arrived in 1896 until his Mahanirvana, Ramana never left his beloved Arunachala. The first place that Ramana stayed in Thiruvannamalai was the great temple. For a few weeks he remained in the thousand-pillared hall. But he was soon troubled by the urchins who pelted him with stones as he sat silently. He shifted to an underground vault known as Patala Lingam, where the sunlight never penetrated. Without moving he sat deeply absorbed in the Self and was unaware of being bitten up by the ants and vermin living there. O Thou of infinite Glory! Of whom the world is a personification! Thou alone are Brahmaa perceptible. Among letters Thou are 'A'. Among Mantraas Thou are Om. Among kings Thou are Manu and among sages are Bhrigu and also Naarada. Among Asuras Thou are Prahlaad. Thou are the Surabhi celestial cow among the animals and Garuda among the birds. Among serpants Thou are Ananta. Among the rivers Thou are the heavenly Gangaa. The vibration in each nadi creates certain feelings or urges in the consciousness. Sensual desire is aroused by some, sloth by some and sorrow by some others. To reverse this, when there is sensual desire there is a vibration in some nadis, and when there is anger there is vibration in some other nadis, and so on for each type of feeling or emotion or urge. We know this from actual experience. When we are at ease there is a special glow on our face and this glow is caused by some nadis being cool and unagitated. There is a saying "One's inner beauty is reflected outwardly on one's face". Our emotions cause their own reactions in our nadis. If we succeed in bringing the nadis under control we shall be masters of our urges and feelings. There will then be no need to depend on any external agency for the purpose. One way of acquiring control over the nadis is the practice of Rajayoga of which pranayama is the most important feature. Mantra Yoga is another. When we vocalize a syllable, the vital breath is discharged through the space intervening our throat, tongue, lips, the upper and lower parts of the mouth, etc. It is then that the syllable is voiced or the "aksara dhvani" produced. Vibrations are created in the nadis located in those parts of the body where the vital breath courses through as a consequence of the aksara-dhvani. Activation of vishuddhi chakram, ideally suited for vocal enhancement and vocal practitioners. Cure of diseases caused by heat. O Thou! The Origin of All! In the beginning Thou were in an undivided state of all jivas in the Hiranyagarbha form. Then Thou do manifest Thyself in multiplicity of jivas, and become associated with Maayaa and its various Gunas. With the well developed and dominant Sattva, devotional attitude is reached, by which the other two gunas Rajas and Tamas are destroyed. By and by when Sattva also is abandoned I (the jiva) shall, again, unobstructed, realise myself as Thyself only. 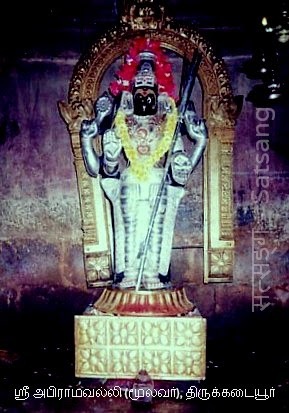 சேர்த்தாளை, முக்கண்ணியைத், தொழுவார்க்கு ஒரு தீங்கு இல்லையே. எங்கள் தாயானவளை, அபிராமி வல்லியை, எல்லா உலகங்களையும் பெற்றவளை, மாதுளம் பூப்போன்ற நிறத்துடையவளை, உலகமெல்லாம் காத்தவளை, திருக்கரங்களில் மலர் அம்புகள் ஐந்தையும், பாசத்தையும், அங்குசத்தையும், கரும்பு வில்லையும் வைத்திருபவளை, மூன்று கண்களையுடைய தேவியைத் தொழுவார்க்கு ஒரு தீங்கும் நேராது; உலகில் வளமும் நலமும் பெற்று வாழ்வர். People, whose minds are purified by performing desireless actions, come to understand from the instructions of competent teachers, Thy supreme aspect which is immaculate, bodiless, taintless, all pervading and transcendent. As for the qualities of multiplicity, stoutness, thinness etc., which are in association with the bodies constituted of the three gunas, are super imposed on Thee. It is like the expensiveness, small ness, dimness and brilliance of fire according to the nature of the fuel (wood) on which it manifests. உழையைப் பொருகண்ணும் நெஞ்சில் எப்போதும் உதிக்கின்றவே! ஏ, அபிராமி! குழையிலே தவழும்படியாகவுள்ள கொன்றை மலரால் தொடுத்த மாலையின் மணம்கமழும் மார்பகங்களையும் தோளையும் உடையவளே! மூங்கிலை ஒத்த அழகிய கரும்பு வில்லும், கலவிபோருக்கு விரும்பக்கூடிய மணம் மிகுந்த ஐவகை மலர் அம்பும், வெண்மையான முத்துப்பல் இதழ்ச் சிரிப்பும், மானை ஒத்த மருண்ட கண்களுமே எப்பொழுதும் என் நெஞ்சில் நிறைந்திருக்கிறது. அத் திருமேனியையே நான் வழிபடுகின்றேன். uzhaiyaip porugannum nensil eppodhum udhikkinrave. Abhirami! Your following form always appear in my mind: breasts with the combined smell of tender leaves and red iris flowers, shoulder resembling the smooth flexible bamboo, sugarcane bow and fragrant flower missiles making lovers fall in great love, smile exposing thy white beautiful teeth and eyes that resemble those of the terrorized deer. Meaning: Starting from Lord Shiva, through Sankaracharya and my aacharya, the guru parampara eternally flows. 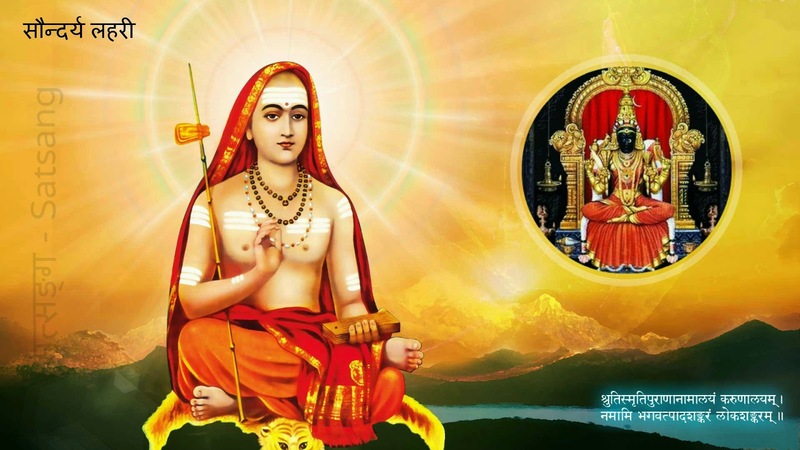 The message that is contained in elaborate discussions in the Bhashyas of Sri Shankara is often succinctly expressed in a century of verses, in ten verses, in one verse or even half a verse. He has reconciled the seemingly contradictory conclusions of the Upanishads and in the integrated view that He has presented the eternal, impersonal, consciousness Absolute is the Brahman, the one without a second. By His power which is inscrutable ( अनिर्वचनीया ) and called maya, or mitya, He appears as the universe, conditions by space, Time, etc., that are ever changing. The jiva is not different from the absolute Brahman, but due to Upadhis appears to be different and subject to limitations. The Upadhis limit comprehensions and are unreal like limitless space appearing like room space, pot space, etc. Thy grace alone will enable me to abondon my love and affection towards my relatives. With my mind merged in Thee, renouncing everything, I will wander about looking upon the whole world as an expression of Maayaa. The injunctions and prohibitions of the scriptures apply to the one who entertains the concepts of good or bad due to multiplicity caused by false comprehension. How can both of these apply to a person whose mind is absorbed in Thee and who has transcended the consciousness of differences. ஏ, அபிராமி! அன்று கயிலையங்கிரித் தலைவனாகிய சிவபிரானுக்கு மணம் முடித்த மலையரசன் மகளே! கடம்பவனத்தில் உறைந்த குயிலே! இமயமலையில் தோன்றிய் அழகிய மயிலே! ஆகாயத்தில் நிறைந்திருப்பவளே! 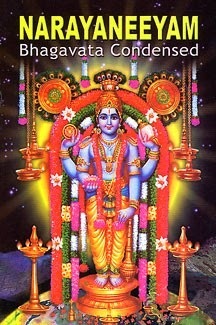 தாமரை மீது அன்னமாக அமர்ந்திருக்கும் திருக்கோலத்தையுடையவளே! (மதுரையில் குயிலாகவும், இமயத்தில் மயிலாகவும், சிதம்பரத்தில் ஞானசூரிய ஒளியாகவும், திருவாரூரில் அன்னமாகவும் அம்பிகை விளங்குகின்றாள் என்பது வழக்கு). kayilaayarukku anru imavaan aliththa kananguzhaiye. 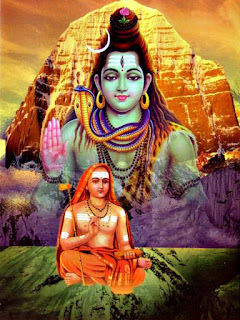 Abhirami got married to the king of Kailash, Lord Siva by Her father Himavan. 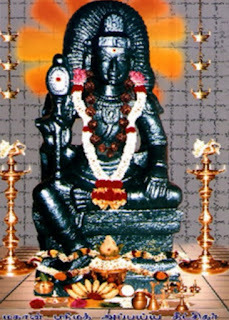 She is cuckoo in Kadambha forest, peacock in Himalaya mountains, wise Sun in Chidambaram and swan on lotus in Thiruvarur. நாள்பட்ட நோய் தீர Cure of chronic diseases, restoration of lost eyesight. Activation of ajna chakra. Strengthens aura and enhances radiance.